With just a few economic reports released this week, traders will be looking ahead to the Federal Open Market Committee meeting on December 15-16. Economic data doesn’t kick off until Thursday with the usual weekly Initial Jobless Claims. On Friday, the Producer Price Index, Retail Sales and Consumer Sentiment Index will be released. To go one step further—a red “candle” means that MBS worsened during the day, while a green “candle” means MBS improved during the day. Depending on how dramatic the changes are on any given day, this can cause rate changes throughout the day, as well as on the rate sheets we start with each morning. 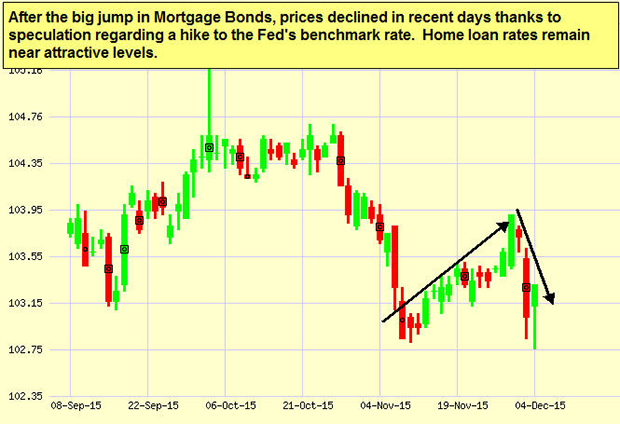 As you can see in the chart below, Mortgage Bonds jumped recently before settling down again. Despite this, home loan rates are still favorable. Ask people what they love doing. Everybody has a story and unique experiences. Find out what they are and what you can learn from them. When you engage people with an attitude of curiosity, you’ll never need to rely on sales scripts, small talk or icebreakers. Introduce yourself first. Don’t wait for people to introduce you. Jump right in. Remember names by repeating them a few times, both in your mind and out loud as you speak together. At networking events, look for opportunities to introduce new people to someone else by name. Make eye contact. When you maintain eye contact, people naturally assume you’re confident. If you feel nervous or find it hard to hold eye contact, just look between the other person’s eyebrows. This appears the same and takes some of the pressure off. Accentuate the positive. Keep conversations upbeat and don’t allow negative people to set a pattern for your interaction. Your intentional, positive attitude will influence others to follow your lead. Stay completely present. If you’re talking one-on-one, make sure the other person feels like the only one in the room. Don’t get distracted by technology or what else is happening around you. If you’re in a group setting, make sure the speaker observes you paying attention. If you’re the speaker, look at each person and acknowledge his or her attention as you go. Give genuine compliments. The more you stay present, the easier you will find it to express your admiration for the things people do or say. And don’t hold back; people don’t compliment each other nearly enough. Soon after putting these tips into practice you’ll discover yourself developing deeper relationships, having more influence and growing your bottom line. Feel free to pass these helpful tips along to your team, clients and colleagues!